It was eventually sold for £1000.00 after being vigorously auctioned with 43 bids being made. 16 X./Flow. 2000E Box. ITS, Based on a MK2 CORTINA 1600E, has Clocks, Axle, Tank, etc, etc. Car is a complete restoration project, On V5 it has Ford, Red. Chassis is solid, has ASHLEY Tag on body. This car needs a complete restoration. Full payment on collection only, Very Rare Car, Telephone for more details. Just looked at V5, the date of registration is 19/11/1980 and its got the year of manufacture as 1968. The registration details show that the car has not been registered since July 1988, so where has it been for the past 23 years and what happened to it between 1960 to 1968 when the rego was issued and 1980 when it was first registered, if you know please email me and let us all know, thanks. 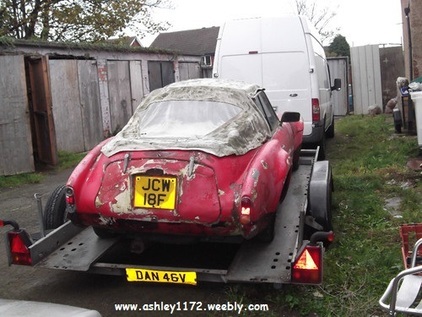 I have tried to contact Dan to get the details of the buyer but have received no reply so if the new buyer see's this page please email me or use the contact page on this site to contact me and let me know how the restoration is going, or if you have sold it on to someone else.